I had to take a break from my personal genealogy quest, as well as this blog. Sometimes that’s the only way to refocus and truly figure out where your heart lies. Mine truly does belong with family, but I had to find myself in order to realize that. I’ve spent the past 3 1/2 years focusing on me and who I truly want and need to be. Now that I have begun to see who I am…. and how I belong in this family tree….I feel like I’m ready to get back to doing my own research. Those that know me understand my self-discovery quest. Those of you following my blog that do not personally know me…. please understand that my love of genealogy has not changed…. only my love for myself. I found a new energy that has renewed my vision and focus. I’m not sure how often I will be posting to this blog…. but I have many ideas of topics and quests that I plan to pursue over the next few months. I hope you join me and find your own “new energy”… BREAK TIME IS OVER!! To DNA…or Not To DNA….That is the question!! 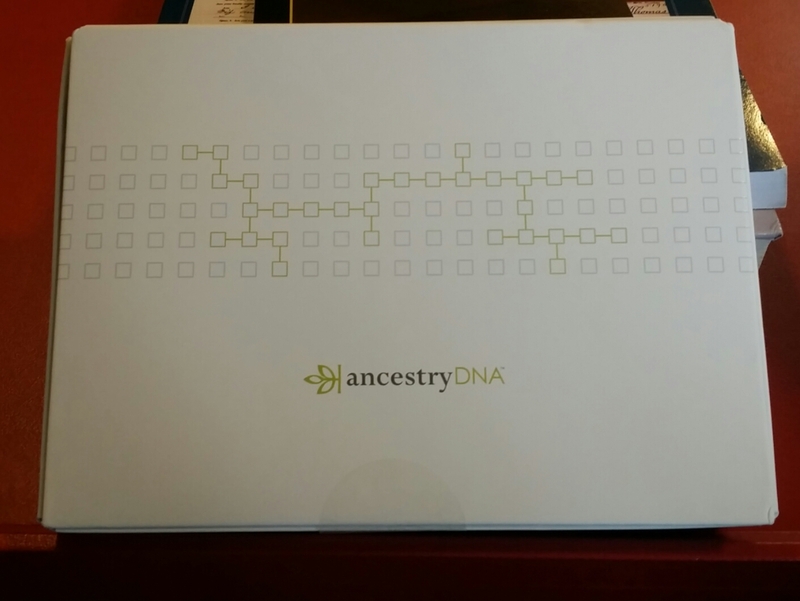 I have been pondering having my genealogical DNA done for quite a while now….and yesterday I took the plunge!! It really wasn’t that I didn’t WANT to have my DNA done…I truly have wanted to get into the spit pool for a long time. Its just that circumstances always seemed to block that path. 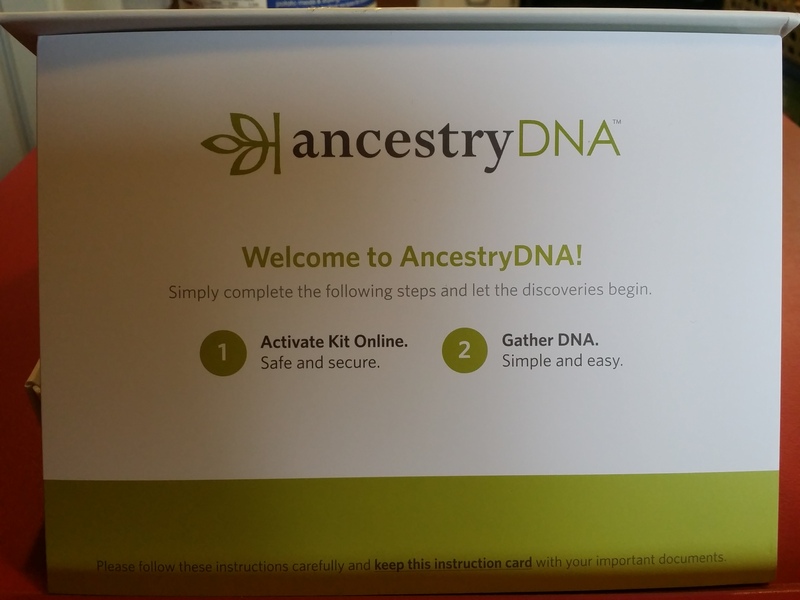 Well, Friday an AncestryDNA kit arrived in my mailbox. Saturday morning I sent it back to them. It really was a fairly easy process…And I thought I would share all the details with my followers. Here it is…my kit. The box was smaller than I expected…I’m not sure why I thought it was going to be a big box with a complicated process, but I did. I was very pleasantly surprised. It was about 5″x7″…very compact and well thought out. I held on to it for a few minutes, thinking about all the possibilities of what the test might prove and the doors it might open. …then I opened it. The first thing you see when you open the kit. This was the first thing that I saw when I opened the kit…its a very easy to understand instruction folder that walks you thru every step of the process. Step 1 – Activate Kit Online. This was super easy!! It only took about 5 minutes and that’s because I was nervous and double and triple checked everything I typed or clicked on. I set it to connect to a family tree I already had on Ancestry.com, but will be uploading my correct tree in the next few weeks and will switch the connection to that one soon. You MUST have a tree to connect it to or you won’t get any connecting results. 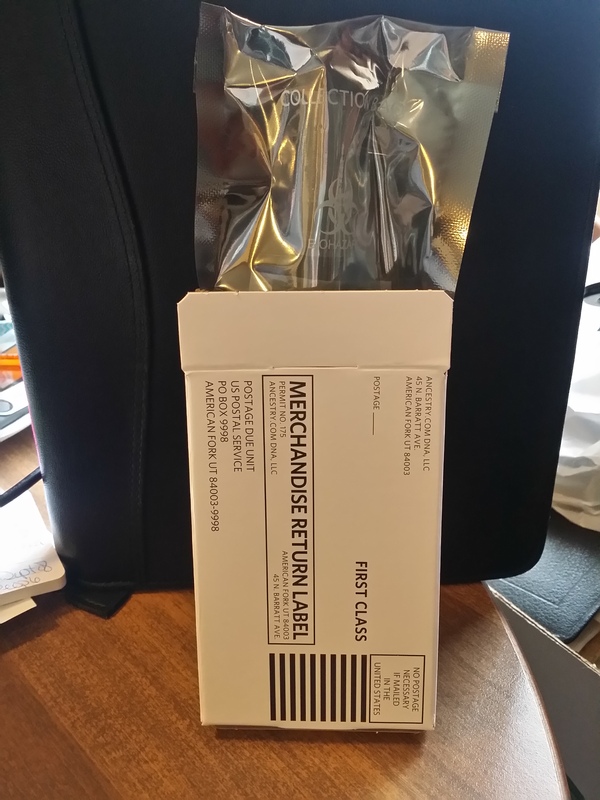 To activate the kit and connect it to you, there is a 15-digit code that is on the collection tube that you use. It’s your DNA’s identity code. They advise that you mark down the code on the space provided on this instruction folder…Mine also had it typed out on a sticker on the back of the folder….So far…EASY PEASY! This was the rest of the kit…The collection tube and stabilizer on the left, the plastic “bio-hazard” bag, and the Postage Paid mailer box. Really simple so far. I took each item out and checked out the process. I can do this!! I finished reading the instructions and immediately realized I GOOFED!!! As I was doing this I was eating breakfast. 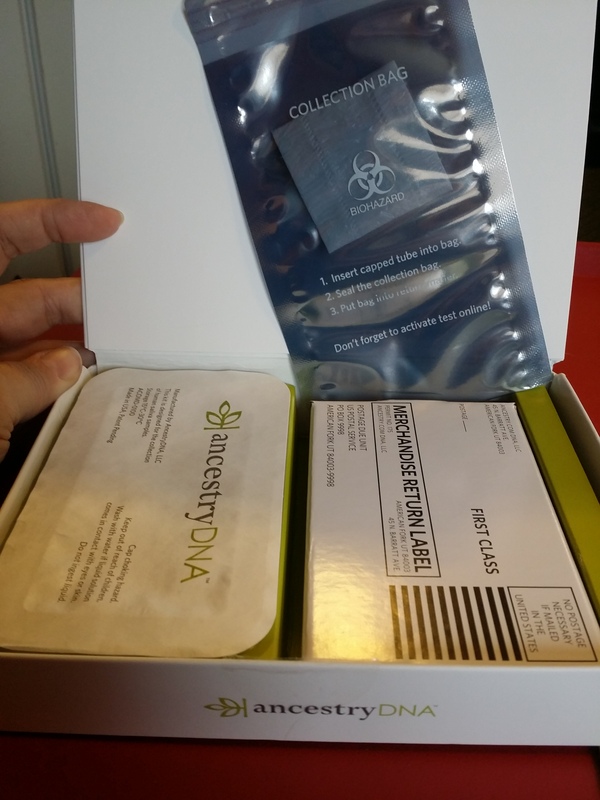 There is a big warning on “Step 2 – Gather DNA” that says “Do NOT eat, drink, smoke, or chew gum for 30 minutes before giving your saliva sample.” DARN IT!! Oh well…can’t change it now…I’ve already started eating my oatmeal…so I’m finishing my breakfast and then I’ll go brush my teeth to make sure no oatmeal gets into the test. You always have to wait for the good things in life. Tick Tock….Tick Tock…I sat watching the timer waiting for at least 30 minutes so I could begin my test. 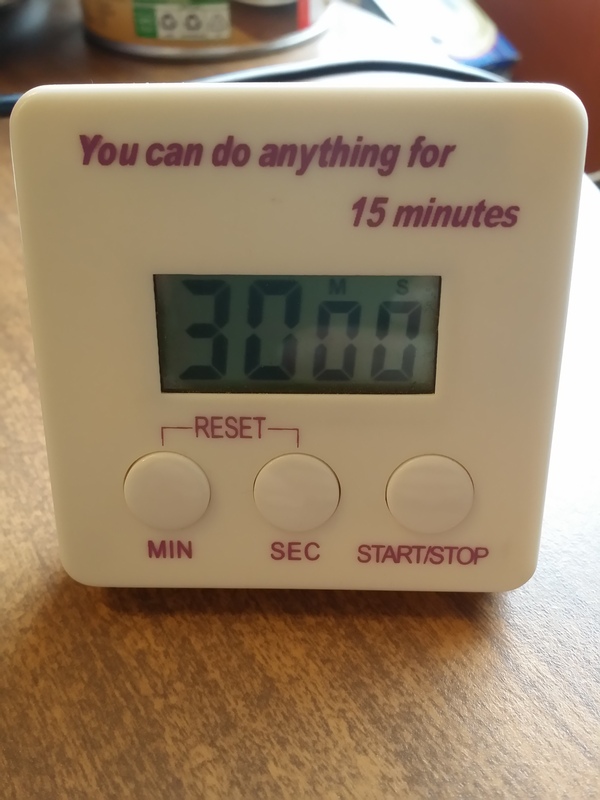 I could’ve used my time a little better by doing laundry, washing dishes, or getting the house cleaned up…but instead I sat and watched the time slowly count down….Tick Tock…Tick Tock….BEEP BEEP BEEP!!! SUCCESS…It’s been 30 minutes…. 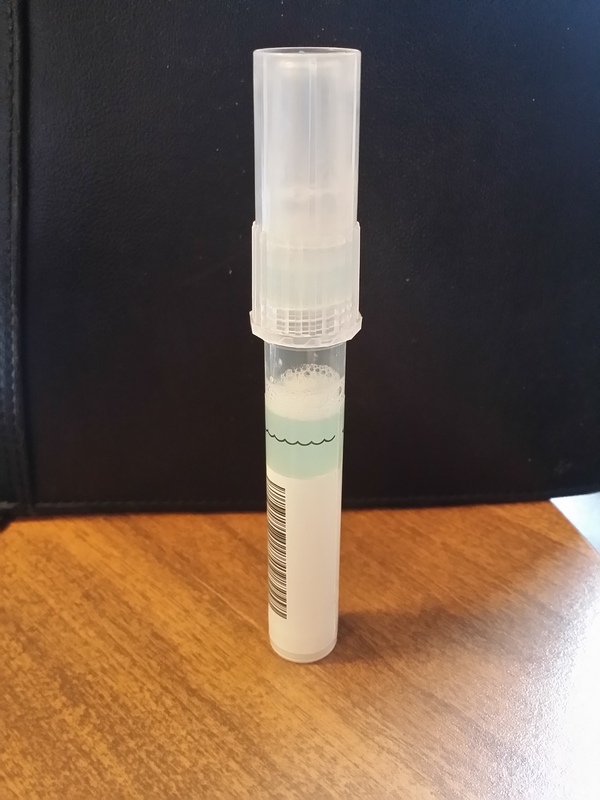 I took a couple extra minutes to catch my breath….And I slowly opened the container that held the collection vial and the stabilizing solution. The instructions state simply to “Fill the tube with saliva to the black wavy line”…That’s easy enough. OK…Maybe not. All of a sudden my mouth went dry! I’m panicking. I remembered reading on a couple Facebook pages that people had to do their DNA test over because they had too many bubbles…not enough sample…contaminated sample…etc. “What if” started racing thru my brain. I can’t mess this up…my ancestors are counting on me!!! I took another deep breath…and started spitting into the tube….as I did it I realized it really wasn’t that bad…they only needed about 1/4 teaspoon…which isn’t much. I kept tapping the vial on the table to try to pop some of the bubbles…and it was filling pretty quick. It only took about 5 minutes to make sure that the sample was just above the wavy line (not including the bubbles)…and then I relaxed a bit. 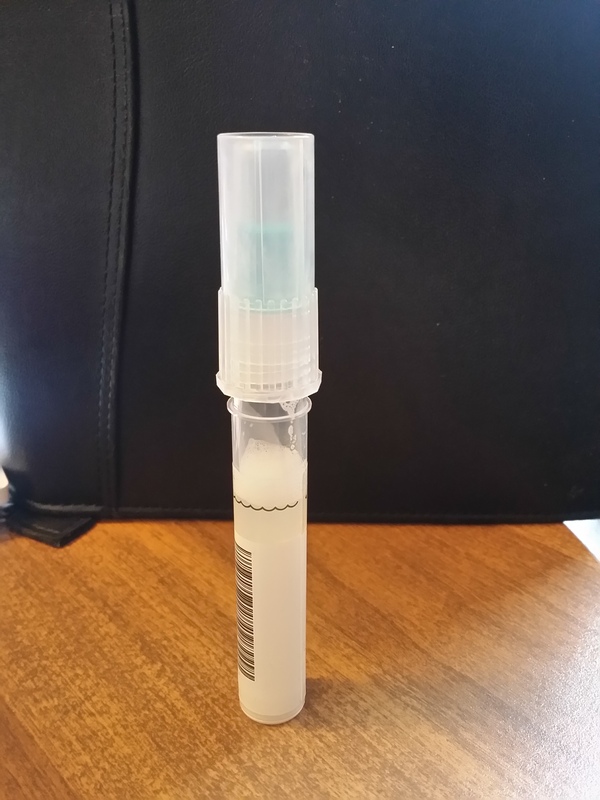 The picture is a bit deceiving…the collection area isn’t the entire bottom of the vial…the collection area is really only about a 1/4 inch in depth…The bottom of the tube is empty! 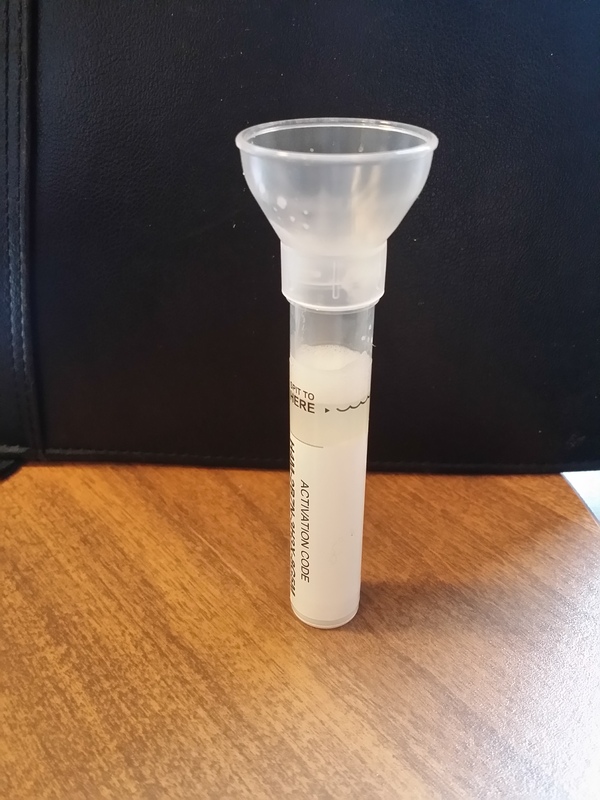 Next step is to take the funnel off the top and replace the funnel with the “cap”…it contains a stabilizing solution to stabilize the DNA in my saliva…. When the cap is tight the fluid will drop…shake it for at least 5 minutes. Perfect! So far so good…..Now I just have to shake it for at least 5 seconds to mix the stabilizing solution with my DNA….this helps the lab process the sample easier. 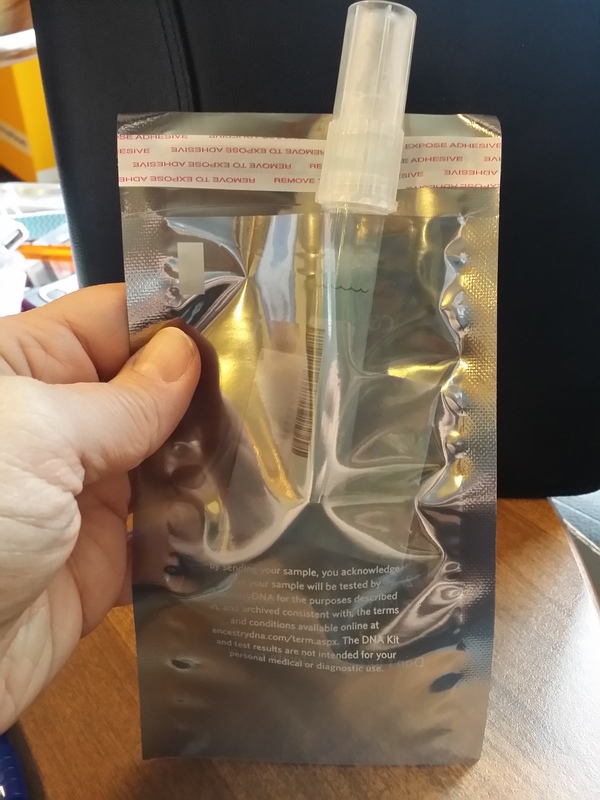 Now its just a simple packaging….drop the vial in the protective Bio-Hazard Bag…. 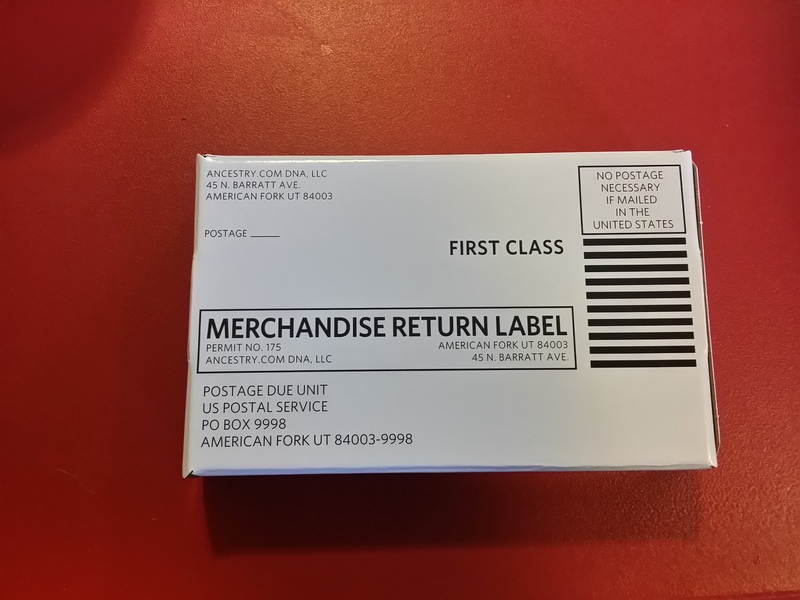 Pop it in the postage paid mailing box…. Close and seal it up…..its ready to go! 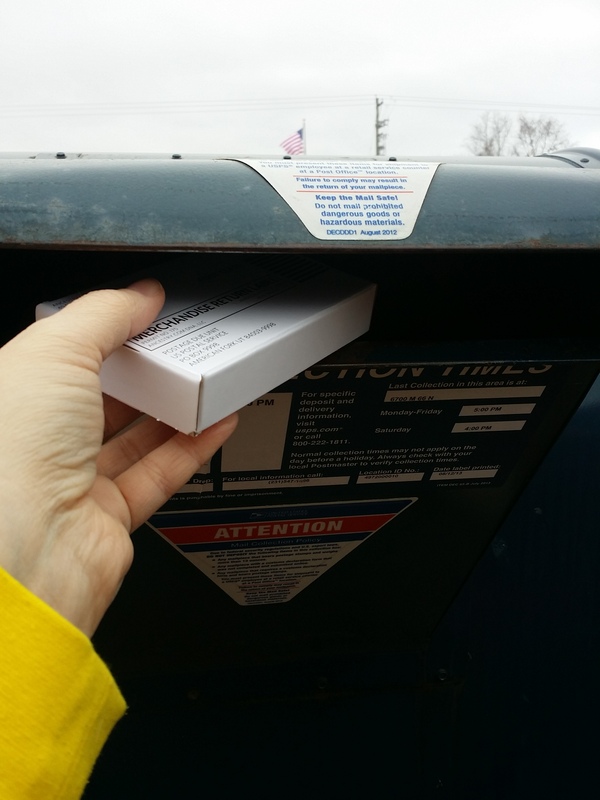 Drop in the nearest mailbox…. I think at this point I started to breathe again. I kept thinking about my ancestors and what they might think of this whole process. Would they be grossed out? Would they be scared of the technology? I don’t think any of them would understand it….and that’s ok. Right at the moment I’m having trouble wrapping my head around the whole process. Unfortunately, now the waiting begins. It’s going to take 6-8 weeks before I receive any results…and I’m still not sure how to interpret them…but I’m learning. I’ve been doing the research…watching the webinars and videos…and taking lots of notes. It might be easier once I have my own results back to use as an example. I will chronicle my process here on my blog as this whole thing begins to unfold. I will share EVERYTHING! Where my ancestors came from…what the ethnicity results are…all the good and the bad that will soon be revealed. So stay tuned!!! Until the results come back I will continue to move my research forward. Now that I’m back here in my blog I will help you all follow my steps…my research…my struggles…my questions…my trips…and even my failures. The Genealogy Fanatic is BACK!! !